Welcome to Paradise! Enjoy spectacular water views from your private lanai. 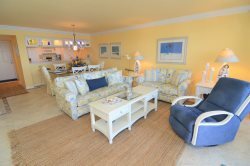 This luxury 2 bedroom / 2 bathroom condo unit offers the comfort and privacy of a home and convenience of access to the Sanibel Harbour Marriott Resort & Spa only steps away. Nip over to enjoy a sunset cocktail at the lounge or serve up your favorite beverage from your fully equipped kitchen. This condo offers a king bed in the master bedroom and a queen bed in the second bedroom. Both bathrooms have a large walk-in shower and accessible to the bedrooms. Excellent electronics throughout. You may have found this rental on HomeAway 4787931, HA ID 4787931, VRBO 4787931ha or Vacation Rentals 4787931. We used the condo as a girls spring break trip. The condo was beautiful and peaceful, with an amazing view from the balcony and relaxing breezes in the evening. It was just what we needed to rejuvenate for our return to the real world.